Text description provided by the architects. The history of Israels Plads (Israel’s Square) reflects the history of Copenhagen’s transformation. This central plaza was once where the city ended in a ring of protective fortifications. As the city gradually extended, the plaza became a vibrant market square – until the 1950’s, when it was turned into a lifeless carpark. The new plaza is elevated above the existing street level - it hovers over the many cars that used to dominate Israels Plads, which are now placed in the underground car park. On the surface, unique facilities have been created to generate inspiration and space for many different kinds of activity. For example, the cut-outs feature round bench formations under the tree crowns, where people can observe the life unfolding on the plaza. There is a green oasis next to the neighboring school, and generous lowered areas for ball games and play are designed in rounded formations. 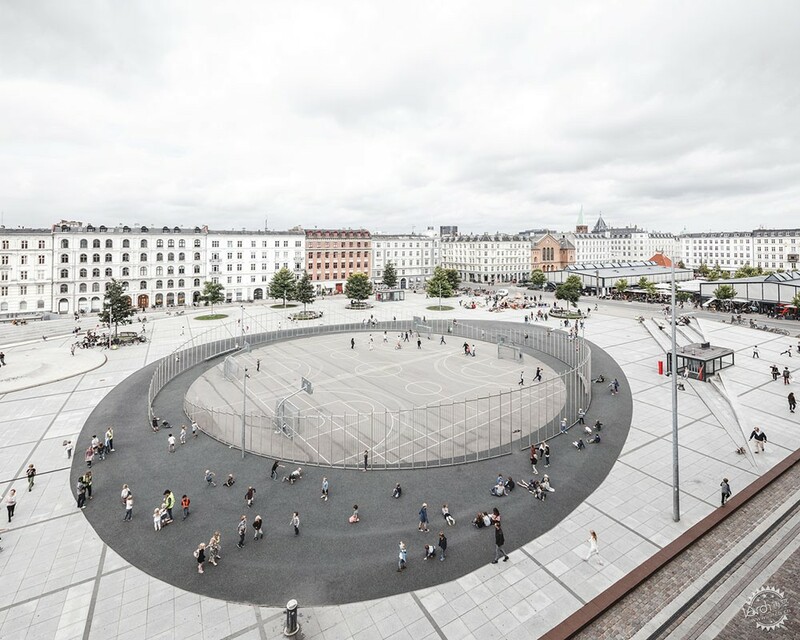 The idea with the new Israels Plads is to celebrate the significance and the history of the site and revitalize it, turning it into a vibrant, diverse plaza for all kinds of people - for leisure, culture, activity and public events.